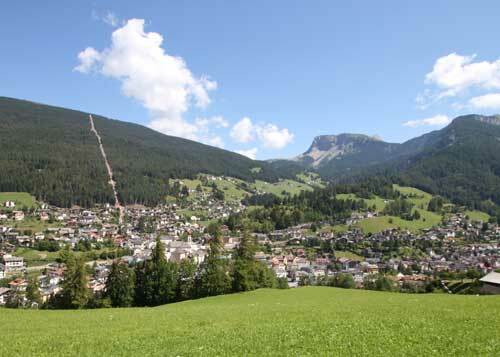 Ortisei, with about 4,700 inhabitants, is the largest village in Val Gardena and, at a height of 1,236 metres above sea level, is ideal for walking or for a winter holiday. Ortisei is also the commercial and administrative centre in Val Gardena and has the largest shopping street and a multitude of possibilities for recreation and shopping. The characteristic pedestrian area in the centre of Ortisei is an ideal base for the most important purchases. Ortisei is also a meeting point from a cultural point of view: many woodcarvers have started a business right in the centre of the village, including Comploj Albert. They offer all their customers beautiful works of art, woodcarvings and crib figures. Even famous actors and athletes are not forgotten, including Luis Trenker (many mountain films remind us of him), Giorgio Moroder (songwriter and record producer of the 80s) and the famous athletes Carolina Kostner (2012 figure skating world champion) and Isolde Kostner (skiing icon of the 90s). One should not forget Ortisei’s fantastic mountain scenery: Resciesa, which can be reached by funicular, Seceda and the Dolomite mountains of the Alpe di Siusi, Monte Piz and Col de Mesdi.